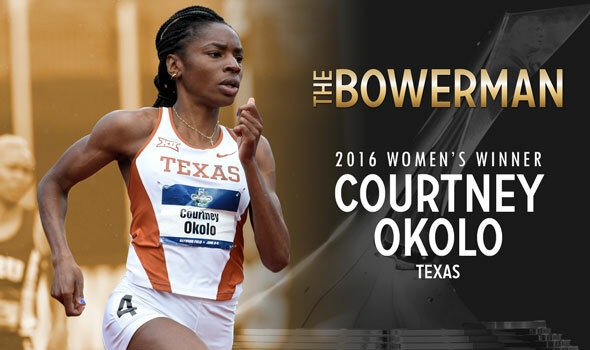 After an undefeated season that resulted in four NCAA titles and a collegiate record, former Texas 400-meter standout Courtney Okolo was named the women’s winner of The Bowerman, collegiate track & field’s highest individual honor. Okolo is the 8th women’s winner of The Bowerman and joins an elite sorority that includes the like of 2016 Olympic gold medalist Brianna Rollins (2013) and 2016 Olympic bronze medalist Jenny Simpson (2009) thanks to a spectacular senior year. The Carrollton, Texas native made history at the LSU Alumni Gold Invitational in late April when she became the first female collegian to ever go sub-50 seconds in the 400, in turn lowering her own collegiate record. Her final year in burnt orange also included an undefeated record against collegians and four NCAA titles (two individual, two relay). Okolo is the first non-consecutive finalist to win The Bowerman. She was also in the final three in 2014, but it was Oregon’s Laura Roesler who nabbed the hardware. Other women’s finalists for The Bowerman were Georgia’s Keturah Orji — a two-time NCAA champion in 2016 who set the American record in the triple jump — and Mississippi’s Raven Saunders — the NCAA outdoor champion in the shot put who broke the indoor and outdoor collegiate records in that event.